I have a mortgage originator friend in Massachusetts, Jeff Chalmers, that is on a mission to emphasize building relationships, or ‘ships, as he calls them, as opposed to building his book of business. He styles himself a “master ‘ship builder.” You see, his emphasis is on meeting the needs of those around him. Given that he is in the mortgage industry, obviously, his skill set is primarily geared towards assisting folks in their financing needs. But he goes so much further than “just mortgages.” He has worked hard to become an ambassador for, and to, the real estate industry. He couples his knowledge with his passion for exceeding folks’ expectations. Jeff and I first met virtually online via Facebook, then in person at NAR’s highly popular Tech Edge conference in Southeast Michigan (remember, Jeff lives in Boston). Why was Jeff at this event? To teach Realtors how to better leverage today’s constantly-changing and robust cloud-based technology. Did I mention that Jeff is NOT a Realtor. The fact that the National Association of Realtors invited Jeff (a mortgage officer) to travel the country to speak to their membership is not only significant, but also quite unheard of. However, as NAR and dozens of other state real estate associations have discovered, Jeff is not the “typical” mortgage guy. A fact that the Women’s Council of Realtors recently acknowledged when they made him their 2015 Regional Director of Communications and Technology and a member of their Board of Directors. However, there is more to Jeff than just his industry expertise and keen intelligence. Without question, what attracts most people to work or collaborate with Jeff is his unyielding passion to make our industry better for colleagues and consumers, alike. That, among all others, is what drew me to friend him online and in life. Jeff is a “high-character” individual. What I mean by “high-character” is that he is first and foremost about his client’s and consumer’s needs. He conveys concern, understanding, and a willingness to exceed their expectations. He is the embodiment of the lenders I recommend in my own business here in Michigan. If I worked in Massachusetts, Jeff would be a highly recommended lender for my buyer clients. So why highlight a lender, if this article is about finding the right agent? Because what makes Jeff attractive to his clients is his high-character. That same high-character is exactly what real estate consumers state they want in their real estate agent. In 2014, 46% of buyers surveyed indicated that the reputation of the agent, and their honesty and trustworthiness were the most important factors in making their decision of whom to work with. Nearly half of all buyers interviewed placed character above an agent’s technical or technological skill or real estate expertise in helping buyers find a home. So, if buyers place a premium on reputation and character, let’s look at what sellers consider to be the important factors in choosing their listing agent. 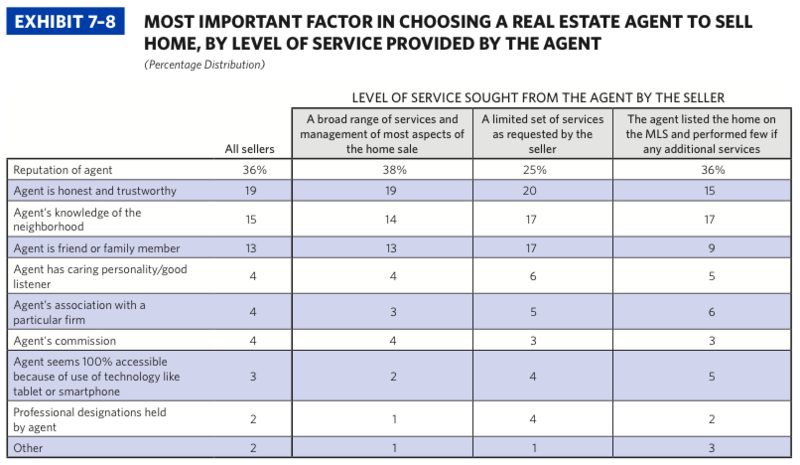 55% of sellers surveyed felt that the agent’s reputation, honesty and trustworthiness were more important than any other trait in their listing agent. Fascinating results, in my opinion. While reputation could be interpreted a variety of ways, it is still fascinating to me that home buyers and sellers alike place character traits above a technical ability when it comes to one of the largest financial transactions people will ever make. We see a similar pattern here, as we did in the statistics above: character is seemingly more valued than technical capabilities. While the current market we are experiencing is a screaming seller’s market, consumers will do well to consider whom they engage in their real estate transaction. Do not allow the velocity of the market to strip you of your strongest advocate at the negotiating table. Do your homework (no pun intended) on whom you will choose to represent you. Often times, we view salespersons as a necessary evil, or sometimes just plain evil. Yet, clearly, there are reputable, highly competent real estate agents and service providers out there to represent your interests. If you have not worked with an agent before, talk with your friends and family about whom they recommend working with. Chances are, you will learn of an excellent agent to meet your needs. If you have worked with an agent before, and were more than satisfied with their work on your behalf, be sure to do them a solid and talk them up to your family and friends that are hunting for a real estate professional. Goodness knows I appreciate it when past clients refer me to the people they love and care about.